Farmingdale's Hall-Dale High School hosted the event. FARMINGDALE — The VEX Robotics Competition “STARSTRUCK” took place Dec. 3 at Hall-Dale High School. Thirty-six teams from middle and high schools from across the state brought their robots to participate, according to a Hall-Dale High School news release. The event was sponsored and organized by the Robotics Institute of Maine, in partnership with Black Bear Robotics Club from the University of Maine and Hall-Dale’s robotics team, REM Delta Prime Robotics 4473. REM 4473 is a member of FIRST Robotics Competition, an international high school robotics competition that gives students real-world engineering experience. VEX is a similar program, creating a platform for students to practice their engineering skills while competing in a series of worldwide events, according to the release. The competition was a qualifier in a series of tournaments culminating in the Maine State VEX robotics competition at Hampden Academy in February, and the VEX world championships in April. The tournament champion was the three-team alliance comprised of team 5156B from York High School and two teams from Cape Elizabeth, middle school team 56E, and high school team 56C. 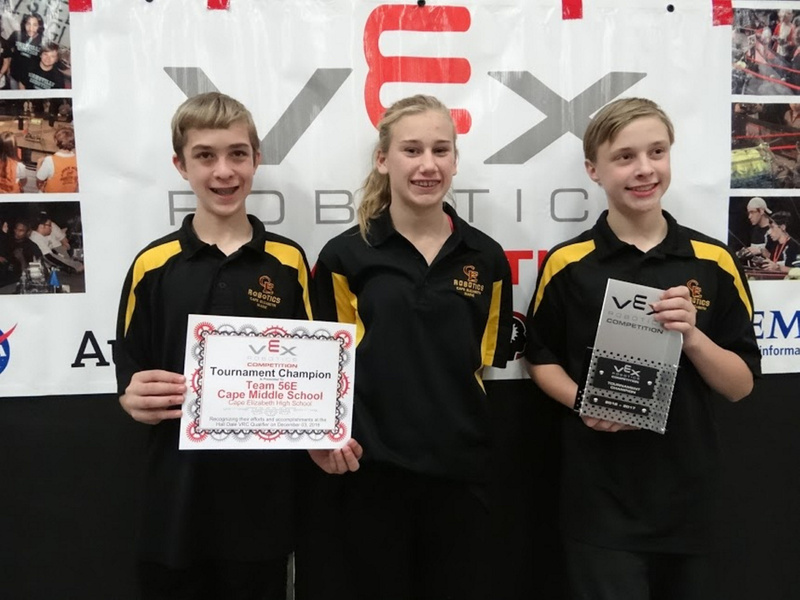 The winning alliance was captained by 56E, the three-member Cape Middle School team, which ended qualification matches ranked number one and undefeated. According to the release, VEX Robotics Competitions statewide are sponsored and organized by Robotics Institute of Maine. RIM’s mission is to inspire youth to gain a new perspective on science and technology by providing opportunities and resources for robotics programs.Their goal is to encourage Maine students to consider science/technology (STEM) pathways to academics and careers through robotics programs that also teach life skills such as time management, leadership and teamwork, critical and strategic thinking, project management, and presentation skills. RIM also organizes and sponsors Maine FIRST Robotics competitions and mentor/student trainings. They also provide funding and support to schools and teachers to encourage new robotics programs, as well as sustain current programs. For more information, contact, William Fahy, student PR coordinator for Delta Prime Robotics at i[email protected], Karen Giles, lead mentor at [email protected], or visit www.deltaprimerobotics.com.